The growing demand for customizations in regenerative uninterruptible power (UPS) supply units amongst Indian industries will keep the vendors in this market on their toes. Companies will have to keep in line with the trend of factoring in unique needs of the customers, increase CNC, and sell reliable and stable units to win bigger shares in the forecast period, says Transparency Market Research in a new study. While Bonfiglioli Transmissions Pvt. Ltd has been leading the regenerative UPS market in India by offering customized UPS solutions, Arvi Systems & Controls Pvt. Ltd also has a noticeable brand presence in the overall market and is expected to retain its position in the foreseeable future. A score of Indian companies are suffering due to power outages and the clear deficit of power supply. The inconsistency of power supply has brought down the revenue earnings for these companies by about 10% on an everyday basis. The urgent need to bridge this gap and optimize production plans will lead to the adoption of regenerative UPS in the Indian industrial verticals. 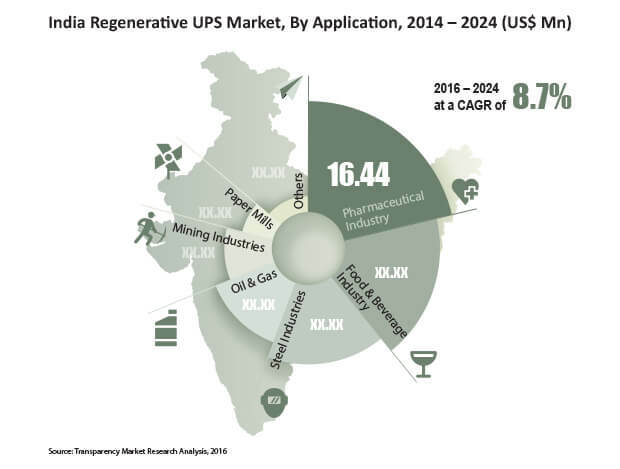 The regenerative UPS market in India will also be augmented by the growing construction projects in the country, which is also fueling the manufacturing sectors and the cement and steel industry. The redundant transmission network across the country are also prompting companies to invest in reliable regenerative UPS systems. The capital-intensive nature of this regenerative UPS is the biggest hindrance to the overall market. Several industrialists and small to medium-sized business owners have shied away from investing in regenerative UPS systems due to their exorbitant installation cost. The existence of traditional technologies and lack of knowledge about the benefits of regenerative UPS are also hampering the growth of this market in India. The availability of counterfeit UPS systems is also posing a tough challenge for the players in the market by poaching into their market shares. Despite the ups and downs faced by the India UPS market, a TMR analysts says, “Initiatives taken by the Indian Government to bring down the burden of energy generation and consumption from fossil fuels is likely to create a stir in the energy management discussion.” This will instigate a movement that focuses on innovative energy conservation methods. Vendors will also find numerous growth opportunities as the government is implementing a strict regulatory framework for standardizing the equipment. The market opportunity of the India regenerative uninterruptible power supply market was worth US$76.86 mn in 2015. In the coming years, the monumental industrial development in the country is anticipated to push the market’s opportunity to US$163.11 mn by 2024. Between 2015 and 2024, the market is likely to sprint ahead at a CAGR of 8.7%, creating a niche for itself in the global economy. As of 2014, the regenerative converter units segment held a significant share of 47.5% in the overall market. The cost-efficiency of regenerative converter units is going keep this product segment in the leading position in the coming years. The rise of small to medium-sized enterprises will also support the growth of this product segment in the coming years.